Prerequisites Students should be familair with Roblox Studio Basics like moving parts, camera controls, and the interface. 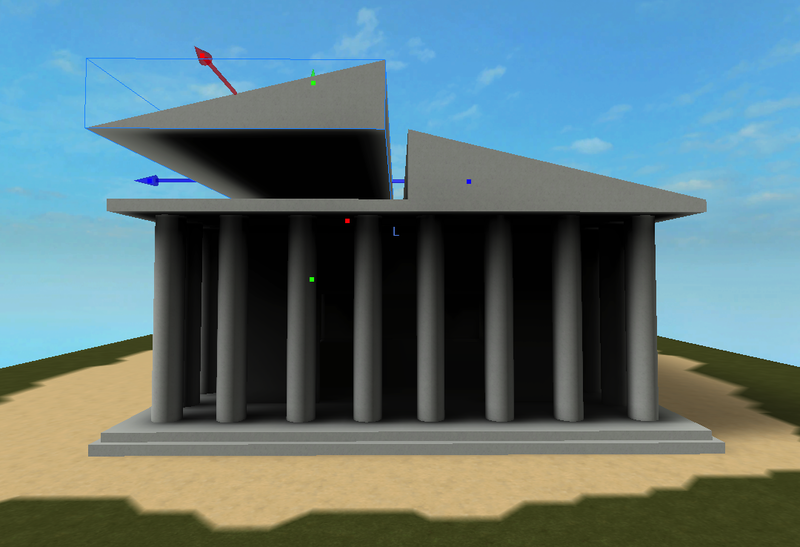 In this tutorial, you’ll build a replica of the Parthenon in Athens, Greece using parts in Roblox Studio. 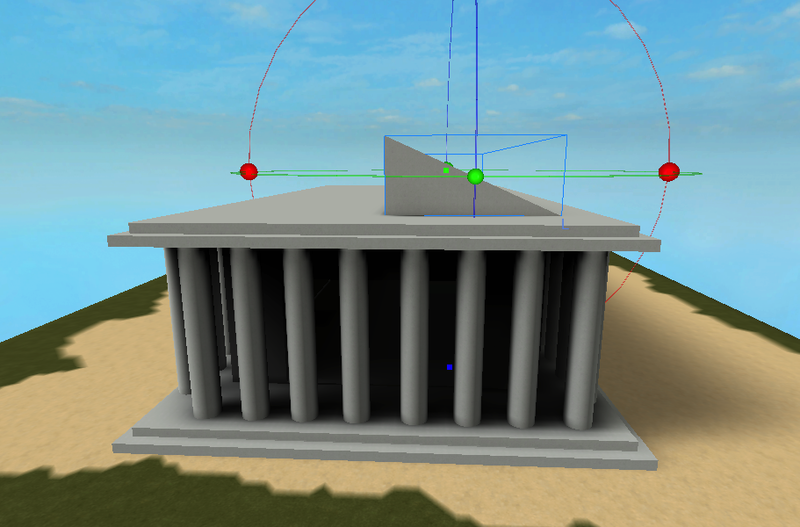 Because the Parthenon has been damaged over time, you’ll recreate the original landmark so you can experience this wonder in Roblox. Adding a character will help you see the size of your building compared to a player so you don’t make a structure too large or too little. Find and open the downloaded character from the computer’s desktop. While you’re building the Parthenon, compare it to the character. Painting a starting area can help you label where your landmark will be. Click here to learn how to paint a starting area for the building. 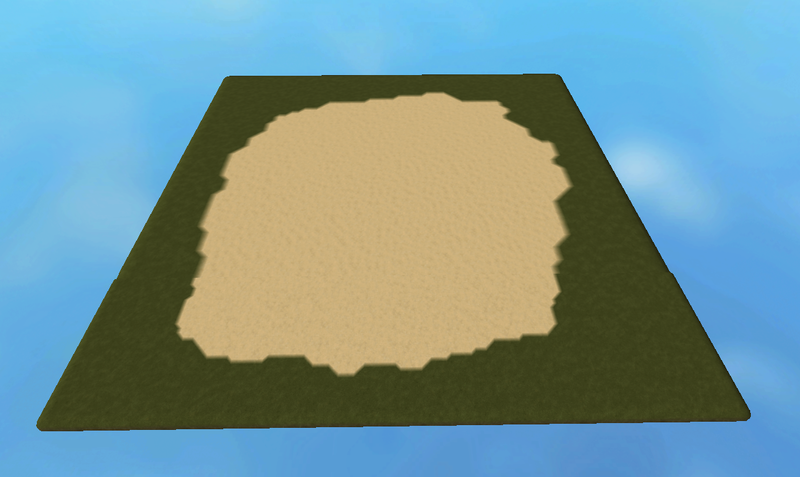 This tutorial will use a flat terrain with limestone on top. Just like constructing buildings in the real world, you’ll start with the foundation before adding props and details. Creating the general idea will help you get the proportions and shapes right before improving it with details. In the Home tab, click the arrow under Part and select Block to create the foundation. In the Explorer, under the Workspace, click the part and rename it BottomFoundation. In the Model tab, click the Scale tool. Drag the handles of BottomFoundation until it fills most of the center of the terrain. Right-click and drag your mouse to rotate the camera. Seeing your landmark from multiple angles will help you find and fix issues early on, like one side being too long. In the Home tab, select the arrow under Material and pick a material. This lets you change the appearance and texture of your parts. In the Home tab, select the arrow under Color and pick a color. In the Model tab, select Anchor to anchor the part. This keeps the foundations from being moved. You should anchor any parts that aren’t supposed to move, like parts of a building or trees. Reference pictures for the Parthenon show there are multiple levels of foundation that make steps. You’ll duplicate the bottom foundation to create the top one. 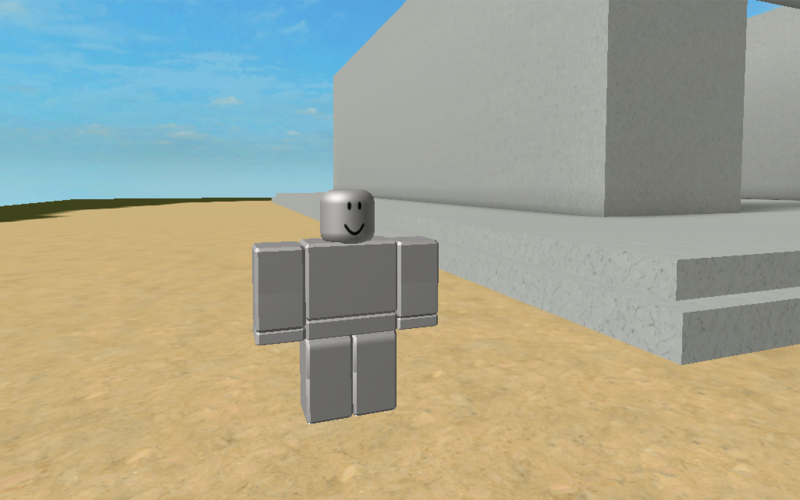 Before creating the top foundation, In the Model tab, check that the Collisions button is gray and turned on like below. If Collisions is turned on, any object that you duplicate will be created on top. If Collisions is off, the duplicate object will overlap with the original. In this case, it’s easier to turn on Collisions so the top foundation is exactly on top of the bottom. Be clear when Collisions should be turned on or off. If a student ever has trouble rotating a part, ask them to check to see if Collisions is on. Right-click BottomFoundation and select Duplicate. An identical part should appear directly on top of BottomFoundation. In the Workspace, rename the duplicated part TopFoundation. Using the Scale tool, drag the handle to decrease the size of TopFoundation until it creates steps. 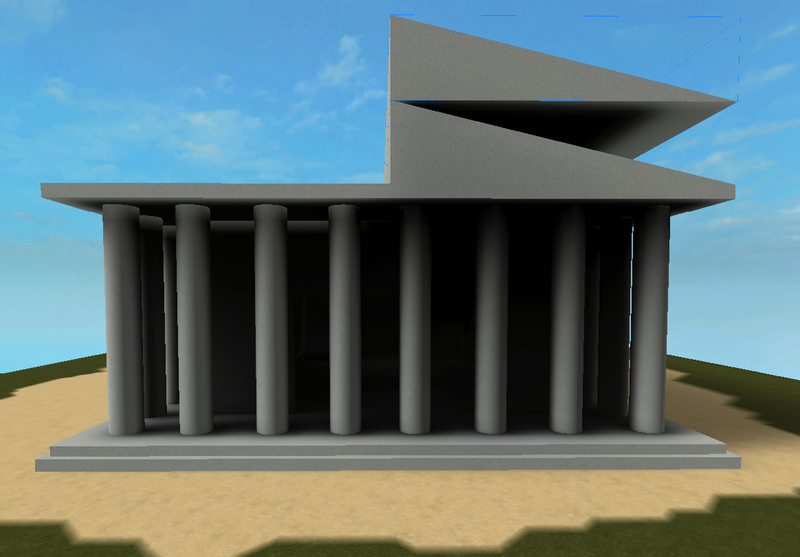 Although the Parthenon doesn’t have closed walls now, you’ll build a room to represent what historians believed its interior looked like in Ancient Greece. You’ll build one wall and then duplicate it to create all four sides. To create the first wall of the room, in the Home tab, click the arrow under Part and select Block. In the Workspace, rename the Part ShortWall. With ShortWall selected, use the Scale tool to resize the part into a wall. To create the opposite facing fall, right-click ShortWall and select Duplicate. Move the duplicated wall to the opposite side of the landmark. 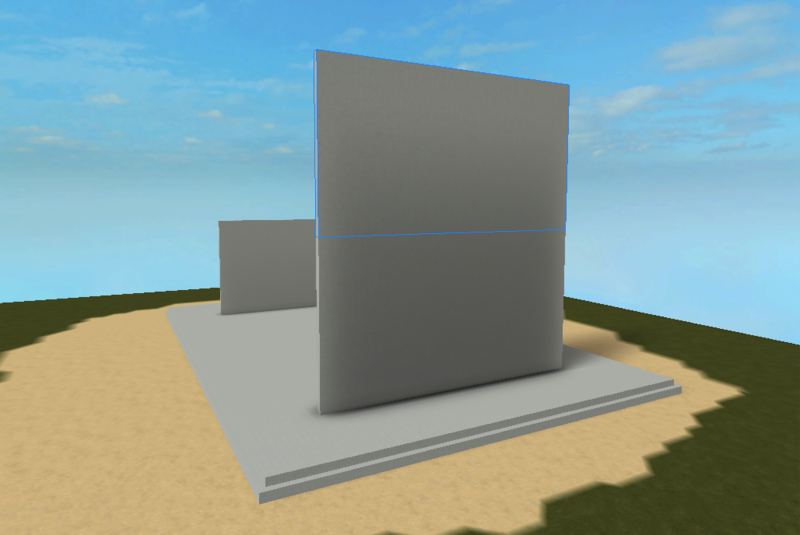 Now that you have added the front and back walls, you’ll add walls on the sides to complete the room. 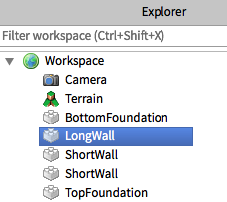 Duplicate ShortWall, and, in the Workspace, rename it LongWall. To make the wall fit, you'll need to rotate it. You'll change the Snap Rotating settings so you can rotate it accurately. In the Model tab > Snap to Grid > make sure the box left of Rotate is selected and degrees are set to 90. Snap to Grid allows objects to only move or rotate a certain amount at a time. With snapping off, it’s easier to freely rotate and move objects, but can be less precise. In the Home tab, click the Rotate tool and drag the blue handles to rotate the LongWall. Move and scale LongWall to be the longer side of the room. Duplicate LongWall and move it to the opposite side to complete the room. Zoom in to make sure that there are no gaps in the corners of your room, or any walls poking out. If you see anything, be sure to scale the room until everything looks even. Without a door, you won’t be able to go inside your landmark. To create a door, you’ll use parts to carve out sections of your landmark. Since a door part will be carving out part of the wall, you’ll need to have collisions off. In the Model tab, check that Collisions is turned off and there is no gray box highlighting it. Now you can move parts through other parts. Add a part named Walkway. This part will be used to carve out the door. Scale the Walkway to make it half the size of SmallWall. Move Walkway through the center of ShortWall. Can't Move the Door Through? Check that Collisions is turned off in the Model Tab. If it’s turned on (the Collisions button is gray), then the door can’t move through. Now that the part is in place, you’ll carve out the door through the wall. With the Walkway selected, in the Model tab click on the Negate button. This will turn the part translucent red, meaning it will remove sections when combined with other parts. Hold down CTRL on the keyboard and click both Walkway and the ShortWall part attached to it. In the Model tab, click the Union button. This combines both parts and removes the space that the red part took up to create a door. In the Test tab, click Play. See if your avatar fits through the door and explore the inside. Once you are finished testing, click Stop. Character Can’t Fit Through the Door? To resize the door, you will need to separate the parts again and resize Walkway. In the Explorer, select the Union part. In the Model tab, click Separate. In the Explorer, select the red Walkway. Resize the Walkway until it will fit your character. Select the Walkway and front wall, and click Union. Adding details, like columns and a peaked roof, will make the landmark more recognizable. The columns around the Parthenon are one example of a defining detail that gives the landmark its characteristic appearance. Just like the walls, you’ll create one column and then duplicate it to quickly create more. In the Home tab, click the arrow under Part and select Cylinder. Since the cylinder is on it’s side, rotate the column to make it upright. Make sure that Collisions is turned off. In the Model tab, if collisions are turned on, the column won’t be able to rotate through the foundation. 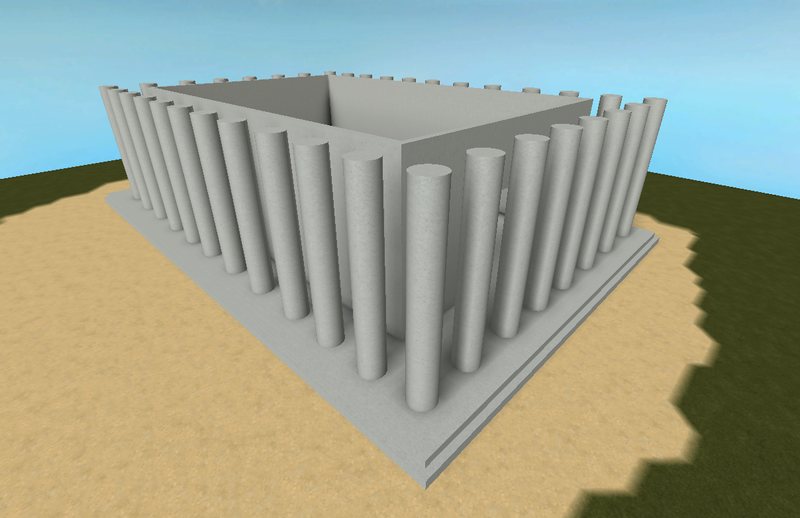 Using the Scale tool, resize the column it’s as tall as the walls. Turn on Collisions so the column doesn’t move through the foundation. Move the column to one corner of the foundation. Duplicate and move columns until there are enough to line the front of the building. 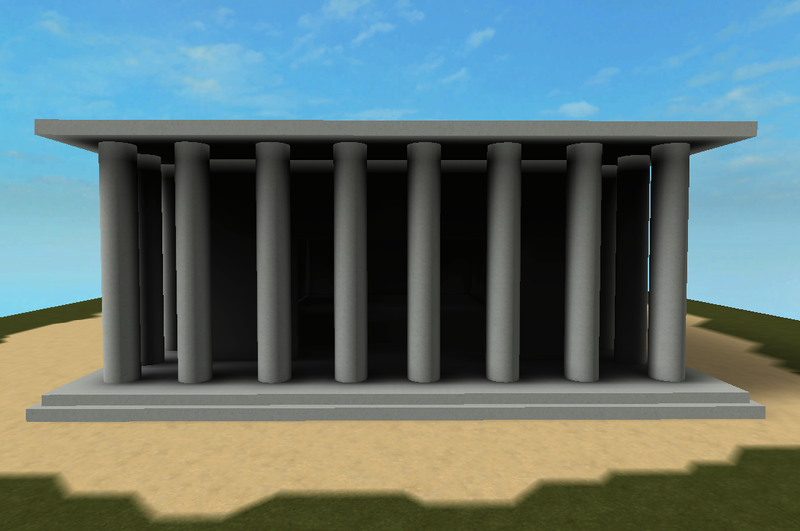 While the Parthenon has many columns on all sides, duplicating every column one by one can take a lot of time. To make this quicker, you’ll union one set of columns and then duplicate them to surround the room. Duplicating a set of negated parts to create multiple windows. Creating a set of towers to quickly build a castle. Duplicating a set of stairs to make an even larger staircase. Hold down CTRL on the keyboard and select all column parts. In the Model tab, click Union. Rename the unioned part FrontColumns. Duplicate FrontColumns and move it to the back of the building. To create the side columns, Duplicate FrontColumns, rotate it, and move it to the side. The columns line the side, but there aren't enough to fill the whole side. To make more columns, you'll separate the union and add more of the original column. To separate the union, select the row of columns on the side. Under the Model tab, select Separate. Duplicate one of the side columns until they line the side of the foundation. Select all of the side columns, union them, and under Workspace, rename the union SideColumns. Duplicate SideColumns and move it to the other side to complete the columns. Drawings of the original Parthenon show a multi-structured roof. 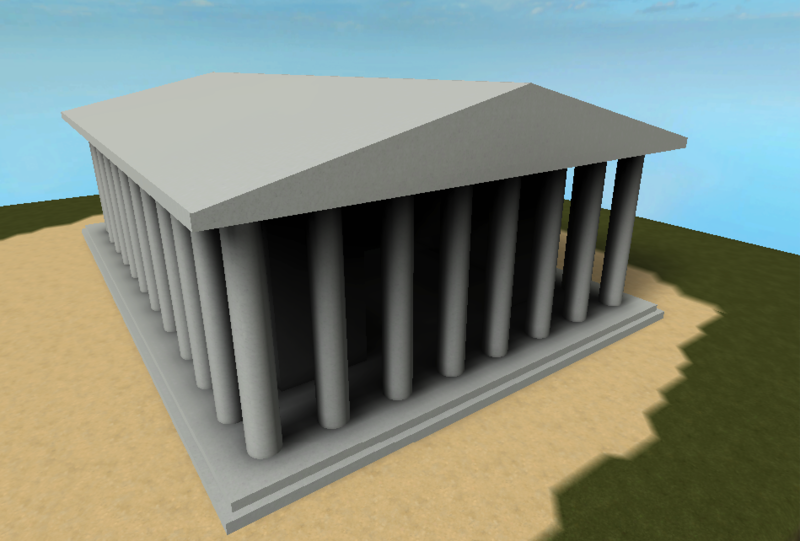 Next, you’ll add a roof to the Parthenon to complete the building. Duplicate TopFoundation, and, under Workspace, rename the part BottomRoof. In the Home tab, click the arrow under Part and select Wedge. Under the Workspace, rename the Part TopRoof. This will be the right side of the roof. Rotate the part so that it looks like the right half of a roof. Scale the wedge so that it fits as the right half of the roof. To create the left side of the roof, duplicate TopRoof. Rotate it, and move it to the other side to complete the roof. Inside the Test tab, click Play. Walk around the landmark with your avatar and explore!